There’s a somewhat contrived jauntiness to this blending of fact and fiction that may leave cynical audiences annoyed. But for those who leave their bah-humbug attitudes at home, it’s a wonderfully entertaining take on a classic. In 1843, when Charles Dickens wrote A Christmas Carol, the holiday was a fairly low-key religious festival. But the book helped create a cultural phenomenon that is still growing. And this enjoyable film recounts how it was written in six short weeks. At the time, Dickens (Legion’s Dan Stevens) was Britain’s most famous author. But his last three novels failed to sell. Desperate for a hit due to financial pressures, he decides to write a Christmas book, something that had never really been done. But he’s distracted by the fact that his wife Kate (Morfydd Clark) is pregnant and his parents (Jonathan Pryce and Ger Ryan) have dropped in for a noisy visit. 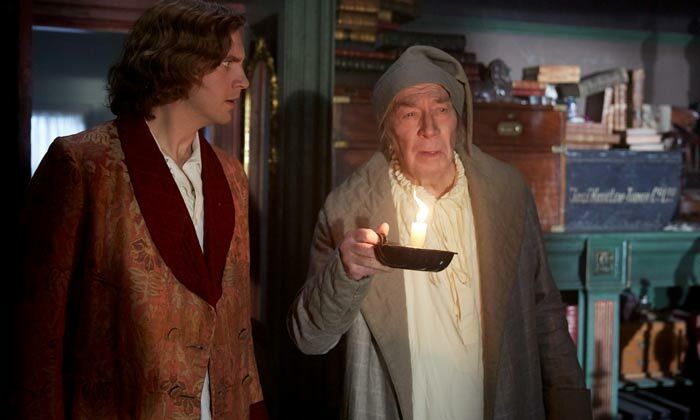 As he plans this new book, the central figure of Scrooge (Christopher Plummer) is inspired by someone he meets, as are the rest of the story’s characters and settings. But he’s struggling to complete the tale, and time is running short. The film basically proves the resilience of Dickens’ iconic novella, because it has remarkable power even when turned inside-out by this script. Director Bharat Nalluri (Miss Pettigrew Lives for a Day) gives the film a twinkly, often comical tone but doesn’t shy away from the darker corners or some strongly emotional moments. And the script includes quite a bit of biographical detail about Dickens’ life without making it too melodramatic. With his book, Dickens wanted to address Britain’s harsh labour practices and the greediness of capitalism, urging people to be kinder to each other. So he reinvented Christmas as a time of year to reach out to those less fortunate. Each of the actors invests a combination of humour and emotion into his or her role. Stevens is likeable and tetchy as Dickens, while Plummer adds some sassy attitude in the way they interact. Pryce and Clark have the most strongly moving moments. All together, the collection of characters and situations offers some amusing insight into the creative process, as well as the way stories play such an important role in our traditions. And of course, as the title suggests, the film also has something to say about what happens when art catches the public’s imagination. There are a lot of elements that have combined to create Christmas as we know it today (including Coca Cola’s reinvention of Santa Claus), but Dickens’ touch might be the most important one.